Chris Davenport is a Protect Our Winters POW board member and is widely regarded as one of the premier bigmountain skiers in the world today. Among his many mountaineering achievement Chris was the first person to ski all fifty-four of Colorado’s 14,000 foot peaks in less than a year. He has also guided and skied on Mt Everest. This month he visits Mt Buller for the first time. Chris is visiting Australia to spread the word on “why we need winter’ and will speak at the Mt Buller cinema on Tuesday 24th July 2018 at 7pm. The talk will be followed by a screening of the new Teton Gravity Research film ‘Rogue Elements’ in which Mt Buller's own Mitch Reeves features. Protect Our Winters activity in Australia started last year when professional snowboarder and POW Founder Jeremy Jones and his family were invited to Mt Buller by long-time friend Tony ‘Harro’ Harrington. The Jones family came to Mt Buller and Thredbo where Jeremy established the first Australian POW resort alliance at Thredbo. This kicked off the the charge towards positive climate action within the snow industry with Falls Creek now also involved and more resorts expected to formalise their participation in the program. Since founding POW 10 years ago the organisation has grown to a global network of over 130,000 supporters and engaging with 60 million+ snowsports enthusiasts across the world, a following that is fast growing momentum in Australian alpine communities. Leading the campaign in Australia is a passionate group of advocates including Tony ‘Harro’ Harrington, Rhylla Morgan, Josh Fletcher and Kerris McLiver based at Mt Buller, all who have extensive experience in the snow and outdoor sports industry. “At the heart of it Protect Our Winters is a passionate crew of diehards, professional athletes and industry brands mobilizing the outdoor sports community to lead the charge towards positive climate action so we can continue to do what we love and live in the communities we care about. We are excited to foster a team of passionate people, athletes and industry professionals to drive this conversation forward in Australia” Tony Harrington said. The Mt Buller and Thredbo events this month are an opportunity to learn more about the POW movement from Davenport who is an inspiring and informed advocate for the POW mission. All proceeds go to Protect Our Winters Australia - thank you to Teton Gravity Research for donating the proceeds of the film screening to this cause. 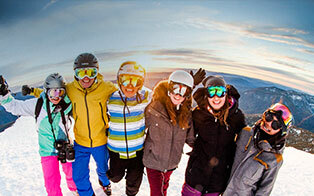 Find out what’s happening around Mt Buller this week! The latest info is right here. Your browser is out of date (Internet Explorer version 8 or under), and may not be compatible with our website. A list of the most popular web browsers can be found below.